Plate of Peas Productions is the name of Rick Beyer's documentary production company. Many people ask about the name. Yes, there's a story behind it. Literally. This is a story I wrote some years ago about a celebrated incident of my youth. It seems to have enjoyed a life of its own. It was read on NPR's "All Things Considered" as part of something called the National Story Project, and published in a story anthology entitled I Thought My Father was God. It has since been reprinted in several other anthologies, translated into German and French, dramatized by a French theater group, and optioned for possible use as part of an HBO special. Would that every project could have the same almost effortless success. My grandfather died when I was a small boy, and my grandmother started staying with us for about 6 months out of every year. She lived in a room that doubled as my father's office, and which we invariably referred to as "the back room." She carried with her a powerful aroma. I don't know what kind of perfume she used, but it was the double-barrel, 90 proof, knock down, render the victim unconscious, moose-killing variety. She kept it in a huge atomizer and applied it frequently and liberally . It was almost impossible to go into her room and remain breathing for any length of time. W hen she would leave the house to go spend 6 months with my Aunt Lillian, my mothers and sisters would throw open all the windows, strip the bedding and the curtains and the rugs, and spend several days washing and airing things out, trying frantically to make the pungent odor go away. This, then, was my grandmother at the time of the pea incident. It took place at the Biltmore Hotel, which to my eight-year-old mind was just about the fanciest place to eat in all of Providence. My grandmother, my mother and I were having lunch after a morning spent shopping. I grandly ordered a salisbury steak, confident in the knowledge that beneath that fancy name was a good old hamburger with gravy. When brought to the table it was accompanied by a plate of peas. I do not like peas now. I did not like peas then. I have always hated peas. It is a complete mystery to me why anyone would voluntarily eat peas. I d id not eat them at home. I did not eat them at restaurants. And I certainly was not about to eat them now. "Eat your peas" my grandmother said. "Mother," said my mom in her warning voice. "He doesn't like peas. Leave him alone." My grandmother did not reply, but she got that certain glint to her eye and grim set to her jaw that signaled she was not going to be thwarted. She leaned in my direction, caught my eye, and uttered the fateful words that changed my life. "I'll pay you five dollars if you eat those peas." I had absolutely no idea of the impending doom that was headed my way like a giant wrecking ball. I only knew that five dollars was an ENORMOUS, nearly UNIMAGINABLE amount of money, and as awful as peas were, only one plate of them stood between me and the possession of that five dollars. I began to force the wretched things down my throat. My mother was livid. My grandmother had that self-satisfied look of someone who has thrown down an unbeatable trump card . "I can do what I want, Ellen, and you can't stop me." My mother glared at her mother. She glared at me. No one can glare like my mother. If there were a glaring Olympics, she would undoubtedly win the gold medal. I, of course, kept shoving peas down my throat. The glares made me nervous, and every single pea made me want to throw up, but the magical image of that five dollars floated before me, and I finally gagged down the very last of them. My grandmother handed me the five dollars with a flourish. My mother continued to glare in silence. And the episode ended. Or so I thought. My grandmother left for Aunt Lillian's a few weeks later. That night, at dinner, my mother served two of my all-time favorite foods, meatloaf and mashed potatoes. 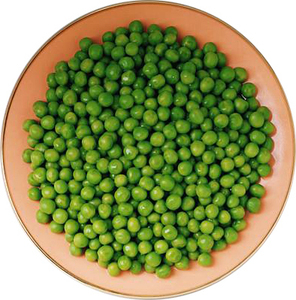 Along with them came a big, steaming bowl of peas. She offered me some peas, and I, in the very last moments of my innocent youth, declined. My mother fixed me with a cold eye as she heaped a huge pile of p eas on my plate. Then came the words that were to haunt me for years. "You ate them for money" she said. "You can eat them for love." Oh, despair! Oh, devastation. Now, too late, came the dawning realization that I had unwittingly damned myself in a hell from which there was no escape. "You ate them for money. You can eat them for love." What possible argument could I muster against that? There was none. Did I eat the peas? You bet I did. I ate them that day, and every time they were served thereafter. The five dollars was quickly spent. My grandmother herself passed away a few years later. But the legacy of the peas lived on, as it lives to this day. If I so much as curl my lip when they are served (because after all, I still hate the horrid little things), my mother repeats the dreaded words one more time. "You ate them for money" she says. "You can eat them for love."